Product #20859 | SKU SARSX110 | 0.0 (no ratings yet) Thanks for your rating! Designed for those looking for a variety of live sound applications. 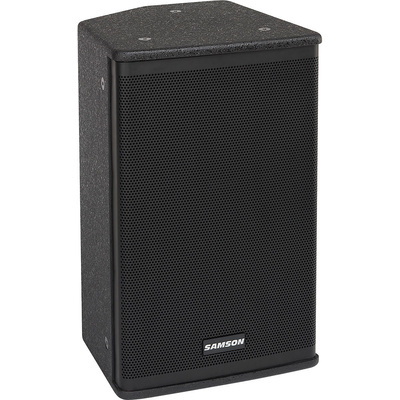 The Samson RSX110 is a 2-way passive loudspeaker designed for sound professionals and performers looking for a variety of live sound applications. It can be used by gigging musicians or in houses of worship and performance venues of varying sizes. Handling 300-watts AES and 1,200-watts peak power at 8 ohms, the RSX110 is suited for small to medium-sized PA systems. It features a Celestion 10-inch low frequency driver with 2-inch voice coil and a frequency response of 60 Hz - 19 kHz. The speaker's high frequency reproduction is created by a Celestion 1-inch PETP compression driver mounted in a 60° x 90° horn with a 1-inch exit. The RSX110 has dual Speakon and 1⁄4-inch phone speaker inputs wired in parallel. This enables you to expand your PA system by directly connecting an extension speaker to the RSX110. The RSX110's enclosure is constructed of solid 9-layer plywood and finished with a durable black, textured paint. Its powder-coated, perforated steel grill ensures protection against wear and tear. The speaker's rugged, roadworthy design also features a 1-3/8-inch pole mount receptacle and an integrated carry handle, making transportation of the cabinet simple. The RSX110 can also be used as a wedge monitor. And for situations that require permanent speaker installation, the RSX110 is furnished with twelve M10 (10mm) fly points.